In some of the most exciting grub news since sliced bread and barbecue chicken, fast-food giants McDonald’s have started testing out some brand new garlic fries at a selection of their stores. The ‘Gilroy Garlic Fries’ are reportedly being trialed at four restaurants in the San Francisco Bay area, according to Time magazine. The new fries are made-to-order in McDonald’s kitchens where restaurant employees toss French fries in stainless steel bowls with a purée mix that includes ingredients, such as chopped Gilroy garlic and olive oil, parmesan cheese, parsley and a pinch of salt. The garlic fries are part of a trend at McDonald’s to experiment with regional flavors and food on its menu. 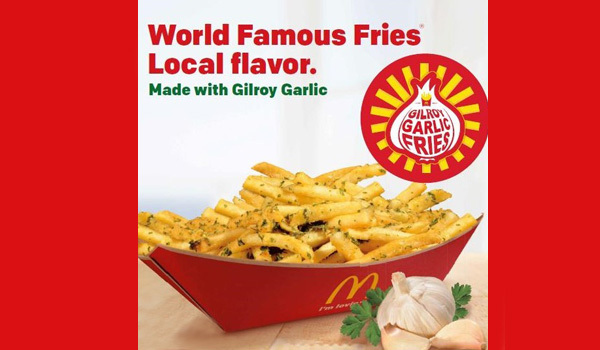 Word is that San Jose-area McD's are serving Garlic Fries with Gilroy Garlic. Initial reports are favorable. Dragon review coming soon. Apparently, the garlic is strictly grown in Gilroy, California, which is nicknamed, ‘The Garlic Capital of the World’, and is about a two hour drive away from San Francisco. If the trial is successful at the four restaurants, then the chain will start offering their garlic fries at nearly 250 restaurants throughout the Bay Area in late summer. Lets just hope that these go global as soon as possible.